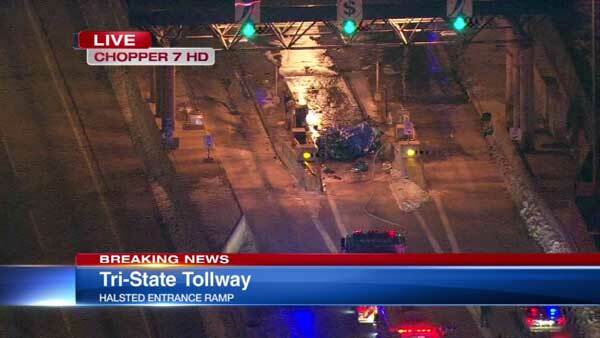 A fatal crash closed the Halsted entrance ramp to the southbound Tri-State Tollway, Illinois State Police said. SOUTH HOLLAND, Ill. (WLS) -- Two people were killed in a fiery rollover crash at the Halsted entrance ramp to the southbound Tri-State Tollway, Illinois State Police said. Around 4:40 a.m. Wednesday, a 2007 Chevy crashed into the toll plaza, rolled over and caught fire, state police said. The fire is out. First responders covered the car with a blue tarp. Investigators said two people were pronounced dead at the scene. They were the only people in the car. They have not been identified. The entrance ramp was closed for several hours during the crash investigation. As of 11:15 a.m., the center lane and shoulders remained blocked. Two lanes were opened to allow traffic through the toll plaza.